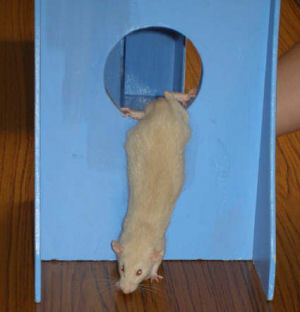 Agility is not for every rat. If after a couple of minutes he still doesn't want to get on the see-saw, then he's probably not going to. Go and get another rat and try again with the first one some other time, but it just might not be his cup of tea. Don't spend more than twenty minutes at a time training. If before twenty minutes are up his attention starts to wander, stop - he'll not learn anything if he's forced. Practice one obstacle at a time - don't try to make him do the whole course in one go. Start with something easy (like the bridge) and work your way to the weaving slowly. Once one obstacle is mastered, add another one; don't do the next one separately. 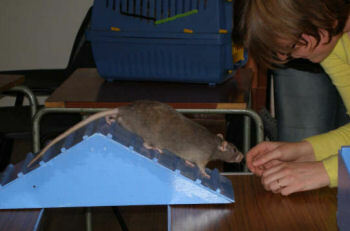 For example, once your rat will go over the bridge no problem, encourage him go through the bridge then jump the hoop. Once he gets to the end of the course, he should get a treat. If you've just taught the first obstacle and he does it, give a treat. Next time, he might have to go a bit further for the treat, but he'll know it's coming, so continue. Don't give a treat at the end of every obstacle. Of course, you need to get him around the course to start with! Try a thin strip of paper and wave that at his nose, just brushing his whiskers with it, and he'll probably follow it out of curiosity. Since each obstacle is quite short, it'll not take him long to get to the end, at which point a yoghurt drop or other favourite treat should be waiting! Alternatively, lead them round with a treat (I've had success with party rings). Now we reach something you probably thought of at the beginning. You'd love to do it, but don't have an agility course to hand. Well, I improvised! 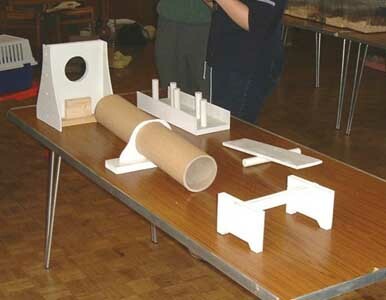 The NERS and MRC agility courses consist of five obstacles, which can all be set up using ordinary household objects, Blue Peter style! Vary where you teach the agility. Remember at a show there is a lot of commotion, and it's a strange place anyway, so anything he's used to doing in a quiet corner of one room will be forgotten. Teach it somewhere quiet and then get him used to it in the sitting room with people round and the TV on. Eventually, they'd be quite happy to perform their tricks in the middle of a motorway - and seeing how busy last month's show was, they need to be that confident doing it! Sellotape a sturdy 12" ruler between two cups. 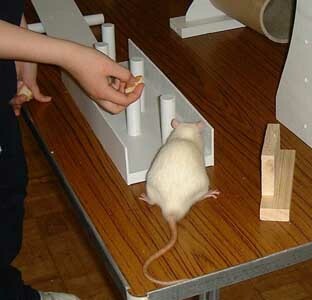 The rat must learn to climb up onto one cup, across the ruler-bridge, and off at the other end. This is training at its easiest - wave a bit of food in front of him, he'll run for it, then just make sure he gets off the bridge before he gets a reward. The main sticking point here is the rat who thinks "it'll be much easier just to walk on the floor", gets off the bridge and then still expects a treat. Making sure the treat isn't given until he reaches the floor after the obstacle makes it much easier when you ask him to do the rest of the course. The easiest of the lot. Teach this one first, as once he gets the hang of one obstacle and knows there is a treat at the end, he will be more willing to learn the other obstacles. To make a home set, attach toilet roll tubes to a piece of wood or cardboard. Stagger them slightly to the left and right - the agility sets the clubs use are staggered, to make it a bit easier. If you can find something to put at the side (a few cassette cases taped together) to make small walls, then he will understand what you want him to do much more quickly. You need to keep darting the reward from side to side, and hopefully the rat will follow. This takes quite a while to teach compared to some of the other tricks, but it is worth persevering. Once he has mastered it, it does look quite impressive. This one is a lot harder, and takes more time than the bridge. I spent a while trying to find something suitable to use for this. Eventually I settled on a big roll of tape (something like masking tape which usually has a bigger central hole than normal tape) taped to the top of a cup standing up, to make a raised hoop. The rat doesn't actually have to jump through the hoop, just drag himself through it, and like the bridge, the treat shouldn't be given until all four paws are on the floor, as this makes linking it to other obstacles much easier. They get the hang of this really quickly. Pretty easy to make, harder to get the rats to do! I used a thin piece of chipboard (the bottom out of one of the kitchen drawers, actually) balanced on a water bottle, but I'm sure there are better ways. It needs to be able to tip back and forth pretty easily. To start with, tip it yourself by hand, a bit slower then it would move normally, and the rat will get used to the motion. Only once he's happy with walking along a moving platform let the platform tip on its own, and although again he will not like it very much, he will find it much less disturbing than being thrown in at the deep end. Surprisingly difficult. They tend to get scared off when it see-saws, as the change in angle confuses them. Again, easy. 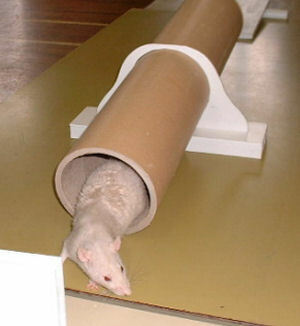 If you've got a long, straight ferret tunnel, you're laughing. If not, a long, wide piece of card rolled into a big tube works just as well. 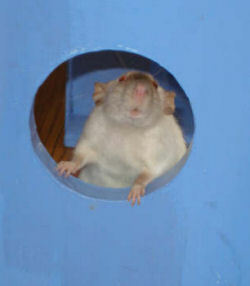 You need to make sure the tube doesn't loll from side to side with a rat in, as this will freak him out. Just Sellotape it to the floor if necessary. To start with, you'll probably have to almost push the rat through the tube from behind. Once he's out, no matter how much pushing and pleading it took, he deserves a treat, a hug, and some kind words in a nice tone of voice - his instinct tells him to stay inside the nice, dark, safe tube, and he's overcome those with a bit of help, to make you happy. It takes a while - longer than the weaving - but eventually he'll run through the tube no problems, and once this is mastered, you can basically teach your rat to do anything! For a few days at least, you'll lose the rat half way through. He'll sit in the middle, have a wash, and refuse to come out!